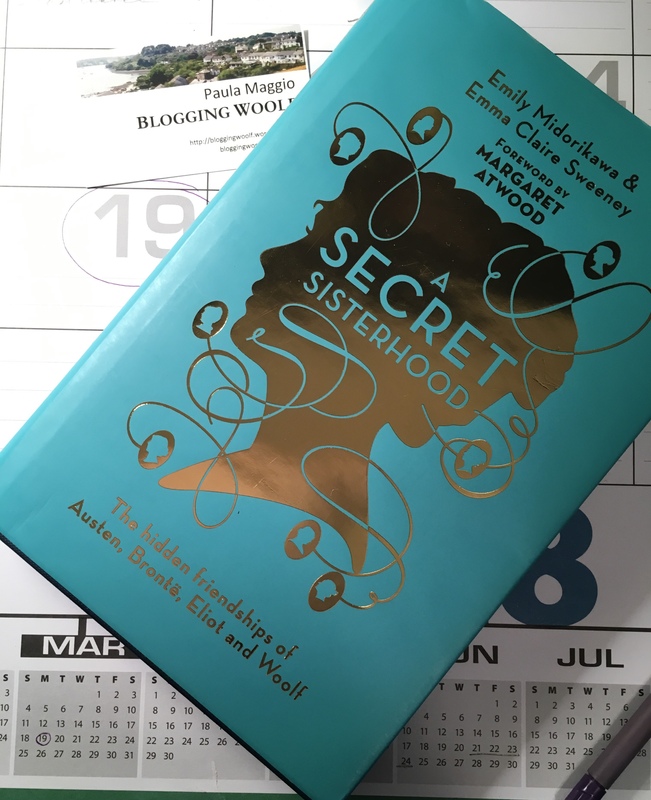 A Secret Sisterhood: The Literary Friendships of Jane Austen, Charlotte Brontë, George Eliot, and Virginia Woolf, by Emily Midorikawa and Emma Claire Sweeney, is out in paperback in the UK today. In the U.S. we have to wait until Oct. 16 for the paperback version of the hardcover book that debuted last October. But that doesn’t mean we must wait to read about it. The authors have arranged a blog tour to celebrate the paperback release as well as Women’s History Month. The tour started today, March 1, and runs through March 19, with a variety of bloggers publishing reviews of the book. The first stop on the tour is A View from the Balcony. Last, but not least is Blogging Woolf. If you have read the book — or read about it — you’ll know BW will focus on the three chapters and 63 pages of “Part 4: Katherine Mansfield and Virginia Woolf.” But I’m also eager to read the forward by Margaret Atwood. 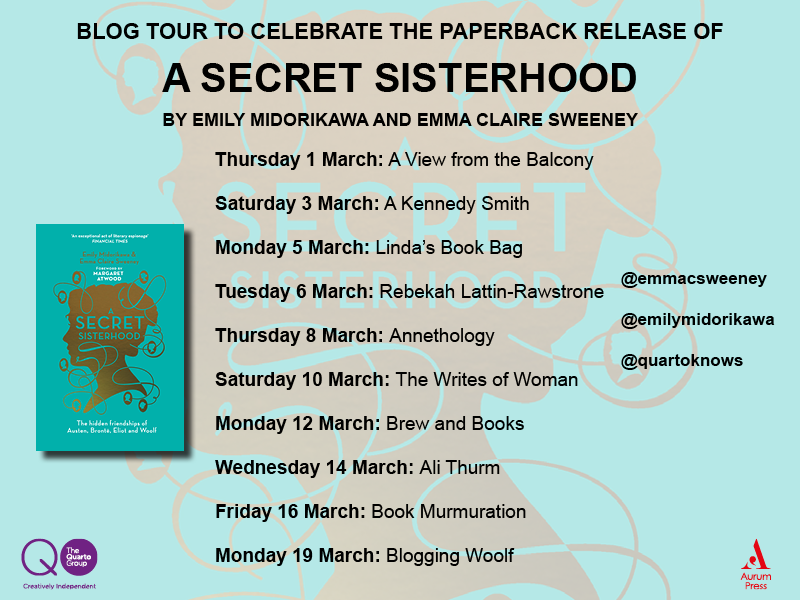 Thanks to Emily and Emma for the invitation to participate in the blog tour. The hardcover version of their book has been front and center on my bookshelf for months now, so I’m glad to have a deadline to spur my reading. “My PhD. was on Woolf, so the Mansfield and Woolf section was a particular joy to research,” wrote Emma in an email. It’s title even caught the interest of my 12-year-old grandson, Michael, who was home sick from school with a tummy bug this week. Camped out on my home office sofa while his mom was at work, his eyes lit on the cover of Secret Sisterhood. It must have sounded mysteriously intriguing because he asked what the book was about. I gave him a two-sentence synopsis. That may have burst the mystery bubble for a bright boy whose main interests are math, science, history, PlayStation, fishing, and baseball (not necessarily in that order). But I just might send him the link to my March 19 review anyway. After all, one is never too young to start appreciating Woolf. The full tour schedule is listed below, and was announced on the authors’ blog, Something Rhymed.